Being involved in a wide variety of photographic experiences, one day hanging out of the door of a helicopter to capture the beauty of the islands to being submerged under the waves, waiting for 'that' fish to poke its head out of a hole, means that Paul is truly able to be your 'go anywhere' photographer. In the world of weddings and portrait photography, he utilizes a style we like to call 'romantic environmental portraiture'- capturing the joy of a moment in beautiful Caribbean surroundings. The greatest thrill for me is to capture a split second for an eternity, an expression, or a moment in a lifetime that may never be repeated, sharing a view of the natural world that may not have been seen before and may never be seen again. 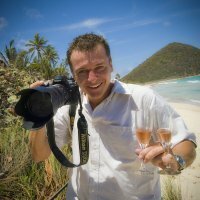 Paul is a qualified Licentiate Photographer with the Society of Wedding and Portrait Photographers (LSWPP) and is also a member of the Societies of International Sports and Leisure Photographers, the International Nature and Wildlife Photographers and the International Schools and Events Photographers. He actively enters photographic competitions and has won several Merit and Gold awards for his images. In his spare time he is a Crew Responder/Medic and is also a Board member for VISAR (Virgin Islands Search and Rescue). He is a keen runner, recently completing the Chicago Marathon and also the BVI Half Marathon and is a keen and active SCUBA diver, qualified as a PADI Master SCUBA Diver Trainer and also certified with The British Sub Aqua Club and Technical Divers International. Paul has now cut his hair and invested in a glass for the rum.